Belmar Marina is also the home of New Jersey’s largest party and charter boat fleet. The boats are privately owned and their prices are at the discretion of the owners. The prices vary depending on the length of time and the type of fishing. They offer special rates to groups, children and senior citizens. Food, drinks and rental rods are available on the boats. They sail 365 days a year as long as there are customers. For more info please click the links below for the operators websites. At Parker Pete's your party will enjoy a day on the water with Capt. Pete at the helm, taking you to the most productive fishing grounds and giving you a tour of the New Jersey Coastline at the same time. With over 50 years experience fishing the Raritan Bay, Sandy Hook and the New Jersey coastal waters, the Celtic Stoirm’s dedicated crew is waiting to provide you with a fishing experience you won’t soon forget. Whether you’re hunting our waters’ top resident predator, the elusive Striped Bass or heading to our offshore canyons for some of New Jersey’s World Class big game fishing, the Celtic Stoirm and crew are here to provide a fishing experience of a lifetime. The crew of the Katie H run one of the cleanest charter boats available and we feature two very well-seasoned captains and a long time deckhand that will ensure to make your day of fishing or cruising on the water a memorial one. Capt. Mike Schneider and Capt. John Decker, both hold a 100 ton Coast Guard License and have been fishing all over the East Coast for over 30 years. Along with our long time deckhand (Mike Murray), who is always there to help you catch fish and takes great pride in making your trip as fun as possible! Looking for a sportfishing charter/adventure off the beautiful coast of New Jersey? A pleasure cruise with family and/or friends? Or maybe you're interested in taking a scuba tour, wreck or technical diving? Look no further! 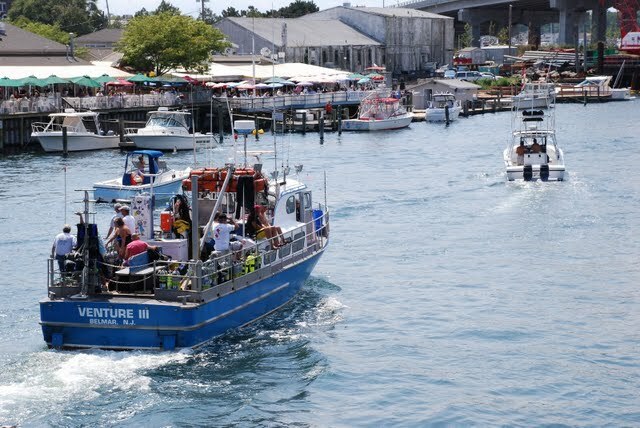 Captain Nick Caruso offers the finest water cruise/adventures on the Northeast Coast! Our state-of-the-art vessels and equipment combined with veteran captains and crew boasting over 40 years of sportfishing and scuba diving experiences in local waters, ensures a great time for all! We provide you and your guests with tackle, bait, rigging, and cleaning of your catch. Skylarker Charters is currently booking next year's spring and summer trips. To secure your charter date call Captain Steve and send in your deposit. The TERI JEAN II is an all fiberglass 45′ HATTERAS. She is powered by twin V-8 diesels and holds 750 gals. of fuel. She has A/C, a full galley, microwave, a head with H/C water & shower plus sleeping quarters for 6 people. She is equipped with loran, GPS, radar, 2 VHF radios, automatic epirb, Halon system, color scope, chart recorder plus additional Coast Guard Safety Equip. 75% of Our Bookings Each Season are Returning Customers. That's right! Because once you've fished with us, you will realize that you've never truly fished before! Deep Sea / Sportfishing: Join us for an exciting fishing trip - whether it's inshore or offshore. an awesome time scuba diving. Pleasure Cruises: Enjoy a great day with your friends or family out on the water!